Whether you are small or big, whether your product is a computer mouse, an office desk, or a crane for an OEM, succeeding at product development is more challenging than ever. Successful companies today are those that can effectively manage product complexity and variability. Our Product Development System uniquely delivers all these capabilities, on an integral, Web-based architecture that supports today's globally distributed environment. 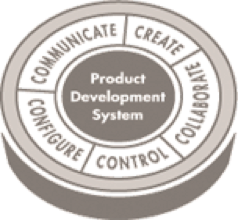 Learn how our Product Development System can help you optimise product development for your company. Enables the capture and development of ideas and intellectual capital into high-fidelity, complete (mechanical, electrical, software, documentation), structured product representations that provide realistic, interactive, and intuitive definitions of a product's look and feel, behaviour, and means of production. Ensures that all stakeholders who participate in the processes of planning, developing, sourcing, manufacturing, documenting, and servicing the product communicate effectively, iteratively capture creative input, and identify and resolve issues early when changes are easy to make. Captures all product content in a single, trusted repository, automates and monitors key product development processes, and facilitates tight alignment of all stakeholders throughout a product's lifecycle. Enables content components to be combined into simple or elaborate structures, producing higher level deliverables such as manufactured products, services, and publications, and managing those evolving structures over time. Drives timely and effective decision-making among internal and external parties, and ultimately delivers dynamic product content to the right audiences, in the right format, on demand.